The Rider is unique in many ways. Don’t miss it. It is the story of Brady Jandeau, a rodeo rider who has a terrible accident and then turns to a search for meaning in life without being able to build it with the horses he still loves but can’t ride. The movie is so deeply real that I was well into it before I understood what I was watching. Brady Jandeau is the principal. There are no actors here. All are themselves. This story is about a man who has spent his entire young life with horses. Early on Jandeau is thrown. While down, his horse steps on his head inflicting a nearly fatal injury. When he removes his bandages, we see his skull is stapled together. We watch this man struggling to build a life around this injury that has changed everything he has built and loves. The story of these real people unfolds in the harsh, unforgiving reality of the windswept Badlands National Park in South Dakota. Director Chloe Zhao is the extraordinary woman who met Jandeau before his injury and decided afterward to film his story. She has done just that with great sensitivity to him, deep understanding of his dilemma, and not a whit of dramatic excess. Still, we can feel the winds and emptiness of those Badlands so acutely that we almost shiver in the theater. Jandeau’s dilemma is rooted entirely in his love of his horse and the loss of the life he had built as a good rodeo rider. Director Zhao gives us the reality of the harsh demands of that life in a way that tells us what Jandeau has lost while we walk just a few steps behind him emotionally in his search for what might give him meaning now that he has lost everything. His life was no hobby; it was who he was. 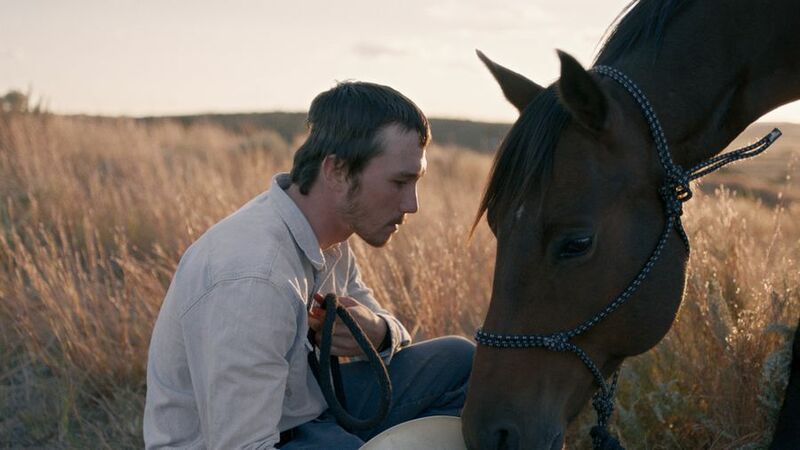 The way Brady Jandeau handles his gun, his horse, or the ropes tell us instantly that this is no actor. How will this real rider reinvent himself in this barren piece of America when he has lost the tools of his passion? He visits his old friend Cat Clifford who had been crippled in an automobile crash and his friend Lane Scott (both non-actors), paralyzed in a rehab facility in his search for a new life. Flashbacks of Jandeau’s riding life show us the depth of his heartache at losing everything he loved. All of it unfolds in the hands of a director who never once succumbs to sugaring the story she sees. These men are “talking shop, drinking beer, rooting for each other.” Director Zhao creates the emotional depth without exaggeration. She and Brady Jandeau deliver the whole tough life to us. Together they give us a deeply American story by inviting us into a world most of us don’t know at all. By the end, we understand its effects on the men who live it and love it so deeply. This review was posted on March 31, 2018, in Drama. Bookmark the permalink.